I am not a gadget girl. I’m just not. I am a book girl. When I first heard about the Kindle I thought it was ridiculous. Why would anyone want to read a book on a screen? Gosh. Then I finally saw one, and I fell in electronic love. I feel pretty dorky about it, but I became obsessed. I had to get one. It’s probably the best purchase I’ve made since getting a stand mixer. It helps that I’m reading a book I enjoy. It has a lot of perks. Mostly to do with the fact that you don’t have to hold a book open. You can eat a sandwich and read a book, no problem. Yeah I’m that person. Not to mention the screen really does look like paper so that’s awesome. Also, I was pleased to find out that you can get amazon credits when you cash in your coins at a coinstar machine and they don’t deduct the 10%. Loose change has now become my book fund. Anyway, enough of me gushing (see, I told you I’m obsessed). I really needed a case for my kindle, so I don’t destroy it when I throw it in my purse…also known as the pit of despair. In a flash I sewed up a simple bag made out of scrap fabric. I went with a medium weight fabric, instead of taking the time to do a lining. Yes a lining would be nicer, but honestly I was feeling pretty lazy. The end product did it’s job but was just plain boring. I’ve been working on a lot of embroidery lately and thought a few stitches would make the whole thing a lot cuter. 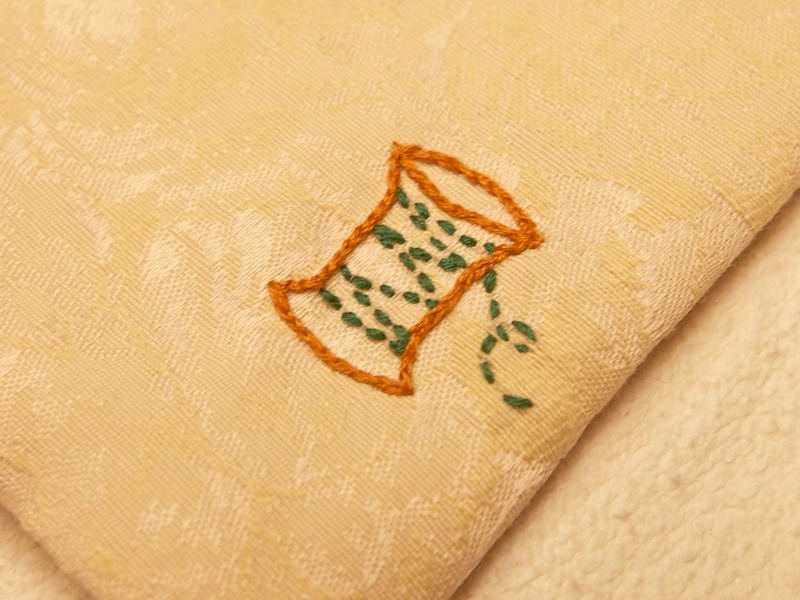 I used a pattern from sublime stitching, even though it was just a simple spool of thread. Sometimes it’s nice to use someone else’s creative power. It’s perfect to protect my kindle from scratches. None of theses designer covers for $85 a pop. Also, why are the majority of the covers made from leather? Gross. This case was free, and took me less than an hour to make including all the embroidery. Ok, back to reading. Oh my gosh I love this post. Cute little kindle cover. After October 1st I can’t wait to do some crafting and catch up on some reading. I totally agree with you about the Kindle. Reading is my favorite hobby and now it’s so much easier, there are lots of free books on Amazon too! For those of us less craft-inclined, etsy has tons of super-cute Kindle cases, most for less than $20. That’s where I got mine, it’s adorable pink and blue polka dots with a little button latch. Oh my goodness, AWESOME BOOK! I read the entire book in a day. Granted, I laid on a couch all day with my nose in it. Such a good read. 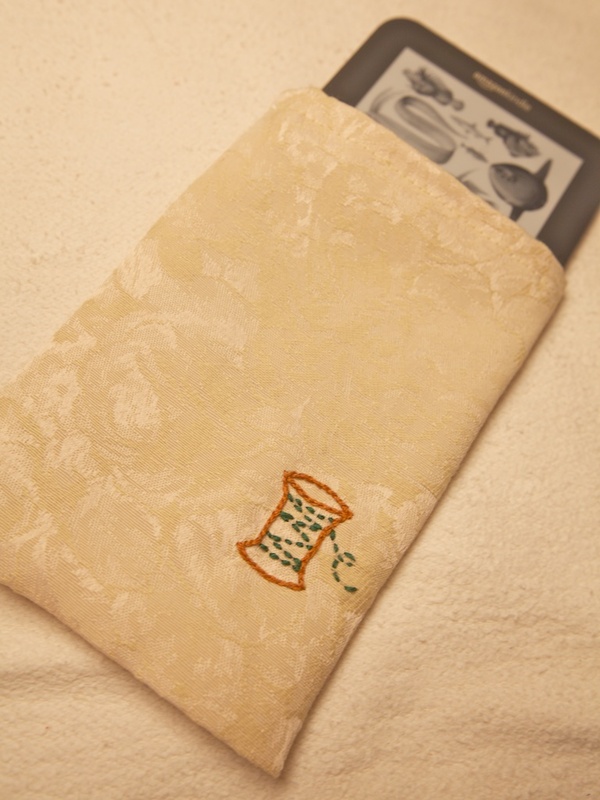 Has it been pointed out to you that your adorable and awesome Kindle cover kind of looks like dough? 🙂 The only thing that makes me sad about my Kindle (and everything else – besides the death of publishing – makes me ecstatic) is that you really can’t read a Kindle book in the bath. AND (I’m not sure if your library does this, but ours does) you can STILL check out free eBooks from the library! WEEE! not only saving trees but saving a lot of space. i have no more room for books. not sure if my library does that but i’ll look into it! that’s adorable. i find it inspiring that you just made your own case instead of ordering one online. so much nicer and more personal. My boyfriend and I were just looking at one of these earlier today, and another couple was telling us how excited they were to buy one. I’m one of those people who ends up spilling drinks on my books sort of frequently, because I’m clumsy and read while drinking out of big mugs, so I am nervous about getting an electronic reader. Plus I like having books. Even though they definitely take up a lot of space in our house. 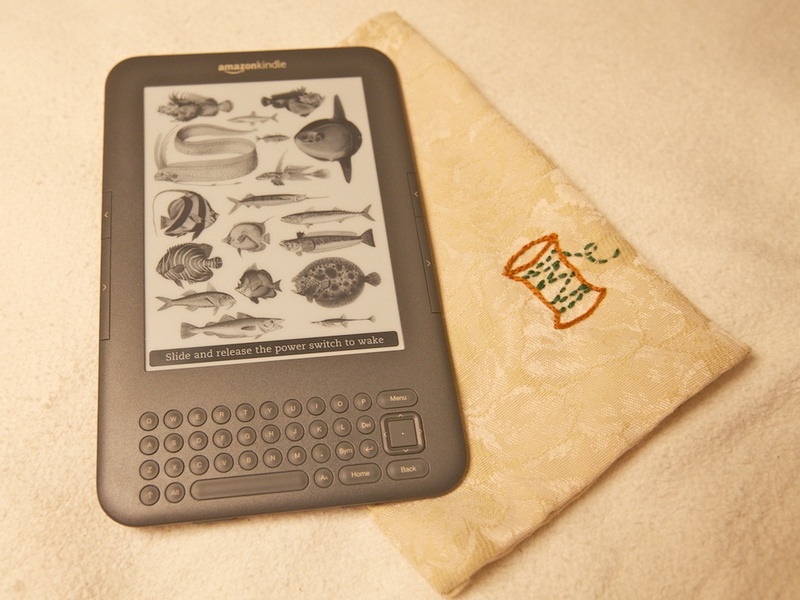 The case you made is adorable and I like all of those sea animals on the front of your Kindle!